From the construction of a market for African Contemporary art in France… to the explosion of African-American art in the United States: a brief look at the “African” wave sweeping across entire the Art Market. A new and apparently widespread trend has emerged on the Contemporary Art Market, which may loosely be described as the “Contemporary African scene”. This relatively new dimension to the global Contemporary Art Market expresses itself in different ways in different places. Whereas French museums and galleries have been working for years to develop a market for Contemporary artists from the African continent, the British are rediscovering (and re-valuing) the contribution of Afro-British artists to their cultural history and the Americans have turbo-boosted the prices of several star African-American artists. The “Contemporary African scene” is therefore not just about artists born in Africa. It includes all voluntary or forced diasporas originating from the African continent and therefore includes a wide range of cultural mixity: Afro-European, Afro-American or Afro-politain, a portmanteau word that appeared ten years ago to designate a resolutely transcultural identity, often appropriated as a marketing argument in lifestyle magazines. In recent years, exhibition curators, museums, historians, art dealers and critics have organised lots of shows and published lots of books devoted to the “African scene”. This new curatorial trend was quickly integrated by the Art Market. Not bothered by semantic debates about the meaning of “African Contemporary art”, the market is only interested in what it is possible to sell. Nowadays, an increasing number of auction operators are organizing specialised sales of works by artists who are African by birth or “by memory”. Their efforts are beginning to bear fruit and they are increasingly focusing on the development of this buoyant market. Several exhibitions have played a fundamental role in the emergence of the African scene, particularly in France, which has a long history with Africa. The first major exhibition dates back to 1989 with Les Magiciens de la Terre, which, for the first time, put artists from five continents on an equal footing with each other (Centre Pompidou, Paris). The curators were Jean-Hubert Martin and André Magnin who subsequently played a vital role in this field. After curating Jean Pigozzi’s powerful Contemporary African Art Collection for 20 years (CAAC, a collection of 15,000 works domiciled in Geneva), André Magnin organised a number of decisive exhibitions (including Out of Africa in London, African Art Now in Houston and 100% Africa at the Bilbao Guggenheim). He also worked towards the development of a market for African Contemporary Art, revealing artists like Chéri SAMBA and Romuald HAZOUMÉ. Sixteen years after the original exhibition, another Magiciens de la Terre exhibition was organised (Africa remix) in 2005, which also represents a milestone in the market’s development. This traveling exhibition took works by Yinka SHONIBARE, Ghada AMER and Julie MEHRETU – some of today’s most in-vogue artists – to Germany, Great Britain, France and Japan. 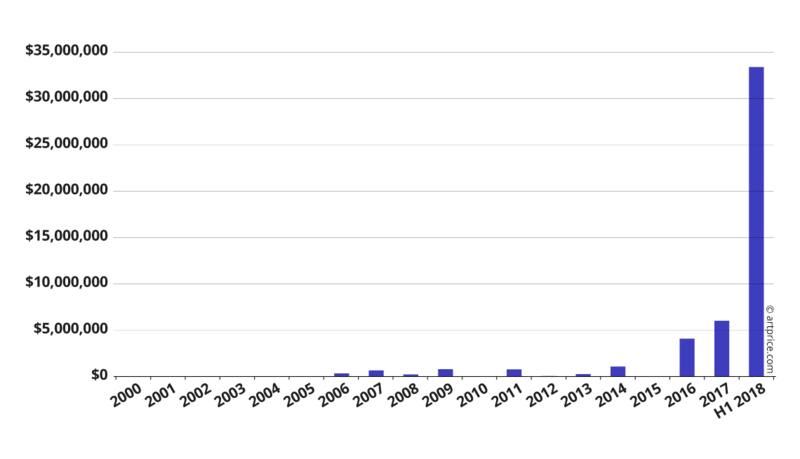 As of 2010, the pace of exhibitions considerably accelerated. In 2015, the Cartier Foundation had phenomenal success with Beauté Congo (150,000 visitors). The following year, Seydou KEITA exhibited works at the Grand Palais; in 2017, the Vuitton Foundation hosted Art/Afrique, while the Palais des Papes in Avignon put on a show entitled Les éclaireurs, sculpteurs d’Afrique. These exhibitions, and many others, have helped to widen the audience of the effervescent African and Afro-descendent Contemporary scene. Several artists who participated in these events have since been integrated into the permanent collections of major museums, including the Centre Pompidou, the Tate Modern and the MoMA. The support of another powerful institution, the Venice Biennale, has also played a key role. In 2013, Angola became the first African country awarded a Golden Lion (Golden Lion for the best pavilion). Two years later, the artistic management of the Biennale was entrusted to the Nigerian curator Okwui Enwezor, while the Ghanaian artist El ANATSUI received a Golden Lion for Lifetime Achievement. In 2017, the same artist was honoured with the Praemium Imperiale, the Nobel equivalent for art. In parallel with the proliferation of exhibitions and signs of recognition, the development of one art fair in particular, 1-54, has expanded the audience and circle of potential buyers. Initiated in London by the French-Moroccan entrepreneur Touria El Glaoui in 2013, this show has become a specialty fair for artists from African nations and their diasporas. The name of the event, 1-54, refers to the 54 countries that make up the African continent. This specialised fair is a response to the under-representation of African artists in the major international fairs and its success has been growing since its inception. 1-54 started in London (15,000 visitors this year), then developed an offshoot in New York during the Frieze Art Fair for four years, and now has an outlet on the African continent, with its first edition in Marrakech in 2018. The fair has managed to carve out a durable position in the international network. We have seen a similar evolution with Victoria Mann’s Parisian AKAA (Also Known As Africa) fair whose mission is “to highlight an artistic scene seen through the prism of Africa (African artists and Afro-mixed influences in the rest of the world)”. The works that AKAA presents has been well received and a third edition will open its door in Paris in November 2018. These two shows are important for the development of the artistic scenes in Paris, London, New York and Marrakech…. scenes that have clearly attracted the attention of auction operators. The construction of a market segment reserved for “African” Contemporary art is not a totally new phenomenon. Sotheby’s opened the way in London in 1999 with the sale of a part of the Jean Pigozzi collection. In France, the auction house Gaïa started working the African Contemporary scene as of 2007 as did Bonhams in London as of 2009, year of its first “Africa Now” sale that has been held annually ever since. At the time, the results were not always conclusive due to a lack of buyers; but the situation has changed considerably. A growing number of artists have earned institutional recognition and support from major galleries. In this buoyant environment, the auctioneers are steaming ahead with optimism, confident in the enormous growth potential of this market. Recently, Artcurial and Piasa (Paris) held sales exclusively dedicated to African creation. In 2017, Sotheby’s London launched a department specialising in African Modern and Contemporary Art. The inaugural sale generated no less than 16 new auction records. Stimulated by the phenomenal growth of prices over the last five years, there is a fast-growing number of buyers in Paris, London, New York, Johannesburg and Cape Town, and the major auctioneers are competing for consignments of works by artists who are already famous and already enjoy international demand, like Yinka SHONIBARE and William KENTRIDGE. Beyond this effervescence regarding African Contemporary Art, mainly focused on London and Paris, we are also seeing a related but much more spectacular phenomenon in New York where several African-American artists have been the focus of unprecedented attention and demand, often driven by powerful political, media and/or cultural support. The American Art Market is quite clearly enjoying a major revaluation of African-American art. We are witnessing a very substantial price surge indicating a new and fundamental trend that looks very likely to stick. The effervescence surrounding African-American art is being felt at all levels: influential galleries are putting on shows… media stars and politicians are ordering works from African-American artists and the museums are developing archives related to African-American art (notably the Smithsonian’s Archives of American Art). Moreover, we are seeing an acceleration of acquisitions and donations (the California African-American Museum has received a private donation of 32 works by African-American artists this year, including works by Sam DOYLE, Jimmy Lee SUDDUTH and Purvis YOUNG) as well as the emergence of “waiting lists” of buyers hoping to acquire a signature as popular as that of Njideka Njideka Akunyili CROSBY. The artistic choices made by Barack and Michelle Obama have probably contributed more than a little to this trend. Already, when they occupied the White House, the Obama couple revised the building’s art display to include African-American artists like Glenn LIGON, William Henry JOHNSON and Alma Woodsey THOMAS. Then came the painting of their official portraits for the National Portrait Gallery in Washington for which they selected two African-American artists: Kehinde WILEY and Amy SHERALD both of whom created portraits that shocked the press and public opinion by their modernity. However, the subsequent media coverage at the beginning of 2018 had a strong positive impact on their prices. Before Michelle Obama commissioned her, Amy Sherald had not really caught the attention of critics and was unknown in the art market. Since then, her style in shades of gray has been seen around the entire planet and the artist has signed with the powerful Hauser & Wirth gallery. Kehinde Wiley, a 40-year-old Nigerian-American from the hip-hop culture, was already known in the United States and France (he has been working with the Templon Gallery for several years) before tackling Barack Obama’s portrait. Unsurprisingly, the order had an immediate impact on demand for his work with a new auction record at double his previous record this year. Kehinde Wiley’s new record now stands at $300,000 for a portrait titled Charles I, which fetched double its high estimate on 17 May 2018 at Sotheby’s in New York. Within an overall context of pictorial parodies of art history, Kehinde Wiley’s art explores issues related to racial and sexual identity, social class and power. His direct references to Ingres, Titian, Rubens or Velasquez seduce by restaging familiar scenes with black figures in ‘alternative’ contexts. Indeed, several African-American artists are also diverting the codes of Western painting to reveal socio-cultural and socio-political constructions by painting black people in unfamiliar contexts. Collectors are jumping into this “new trend”, as we have seen with the recent exceptional auction results for works by Njideka Akunyili CROSBY, Barkley L. HENDRICKS and Kerry James MARSHALL. Raised in Los Angeles, Kerry James MARSHALL has forged his character with the black-American emancipation movements that his art echoes. Via the use of pigments like carbon, Marshall pushes the carnation of his characters to the deepest black in compositions that revisit Western pictorial traditions, from the Renaissance to modern times. Supported since the early 1990’s by gallerist Jack Shainman, Kerry James Marshall gained a wider audience through an exhibition at the Whitney Museum Biennale and another at the Kassel Documenta (1997). In the early 2000s, a traveling exhibition – Meditations on Black Aesthetics – expanded his American audience. Appointed a member of the Arts and Humanities Committee by President Barack Obama in 2013, a few months later he joined the powerful David Zwirner Gallery. The leverage effect on his prices was immediate with a first million-plus result for a work entitled Vignette, which reached $1.025 million on 13 November 2014 at Christie’s after selling for $541,000 at Sotheby’s in 2007. Once that symbolic threshold had been crossed, Marshall’s prices started to rise at a galloping pace. On 10 May 2016, year of his first major American retrospective (Kerry James Marshall: Mastry at the Museum of Contemporary Art Chicago, the Los Angeles MOCA and New York’s Met Breuer), the artist doubled his previous record with a result of $2.1 million for his Plunge at Christie’s. However there was no lead up to the next step: on 16 May 2018 Sotheby’s presented his Past Times, a huge canvas depicting black characters indulging in the typical activities of the white American bourgeoisie – croquet, golf, boating – and restaging MANET’s Le Déjeuner sur l’herbe. The bidding soared to a staggering $21.1 million – nine million above its high estimate – setting the absolute record for a living black-American artist. This painting, acquired for $25,000 by the Metropolitan Pier and Exposition Authority in the year of its creation (1997), is the latest known acquisition of Sean Combs, aka Puff Daddy, who is familiar with the art market and already owns works by AI Weiwei, Andy WARHOL, Keith HARING and Jean-Michel BASQUIAT. At the same sale Sotheby’s was also offering two other Afro-American signatures, Njideka Akunyili Crosby and Barkley Leonnard Hendricks, whose works also buried their estimates. Unfortunately, Barkley L. HENDRICKS died in April 2017 a few months too early to enjoy his record of $2.1 million – double its high estimate – on 16 May 2018 for his painting Brenda P depicting the singer Brenda Payton in 1974. Born in 1945, Hendricks also appropriated the codes and techniques of the Old Masters in his paintings of black subjects. Nigerian-born artist Njideka Akunyili CROSBY (who lives in Los Angeles) was revealed in 2016 when she won the Canson Award in New York. Her first appearance at auction in the same year took place just before an exhibition of her work at prestigious Victoria Miro Gallery in London. Since then, she has accumulated six million-plus results and her production is struggling to keep pace with demand that has already reached as far as Hong Kong (7.5% of her auction turnover versus 62% in the United States). Crosby’s current auction record was hammered on 7 March 2017 at over $3 million at Christie’s in London for a canvas depicting the artist’s big sister when she was younger (The Beautyful Ones). It was acquired by none other than Peggy Cooper Cafritz, a outspoken militant for the ending of race laws and racial prejudice in the United States and a major collector of Afro-American and African art who died earlier this year. Njideka Akunyili Crosby quickly managed to convince Art Market professionals of her talents and she has rapidly become the spearhead of this new generation of African-American artists in so much demand. In her slipstream, other Afro-American artists in their thirties are making a name for themselves at auction, including Adam Pendleton and Toyin Ojih Odutola, whose prices are rising super fast. The young Adam PENDLETON, aged 34, has a new auction record of $225,000, against a high estimate of $60,000 since 15 November 2017 (Black Dada (K), Christie’s New York). Pendleton has already attracted major galleries such as Pace and Max Hetzler who signed with him in early 2018. Just a few months younger, Lecture au jardin (born in Nigeria, brought up in Alabama and now living in New York) made a sensational auction debut last May with a 35-centimeter drawing that fetched no less than $62,500 at Sotheby’s against an estimate of $10,000 to $15,000 (From a Place of Goodness, 17 May 2018). It was an important year for this promising artist, with a first exhibition at the Whitney Museum (To Wander Determined, October 2017 – February 2018) and a new contract with the Stephen Friedman Gallery. In 2014, the publication of Eddie Chambers’ book Black Artists in British Art: A History Since the 1950s filled a substantial gap by relocating the history of black artists in the history of British art. The author mentions, in particular, a “triumphant triumvirate” composed of Steve MCQUEEN (the first black British artist to be offered a solo exhibition at the Institute of Contemporary Art in London), Yinka SHONIBARE and Chris OFILI, the latter two having been revealed thanks to the stimulus of the Saatchi gallery and the emergence of the Young British Artists in the late 90’s. Eddie Chambers ends his book discussing a number of recently acclaimed artists, including Lynette Lynette YIADOM-BOAKYE, who has already crossed the million-dollar threshold at auction this past year. Born in London in 1977 to a Ghanaian family, Lynette Yiadom Boakye poses serious questions about black subjects and Great Britain’s colonial past. Two of her works fetched over $300,000 last year in London, while a third, The Hours Behind You elicited earnest bidding at Sotheby’s New York in November 2017: estimated $250,000 – $350,000, the large canvas generated a record $1.6 million. The market’s enthusiasm is palpable and that record is not isolated. A number of other Afro-British artists have done well on London’s auction market this past year, including Yinka SHONIBARE, Henry TAYLOR and Hurvin ANDERSON (1965). Yinka SHONIBARE and Henry TAYLOR each acquired a new auction record above the $300,000 threshold this past year. On 7 March 2018, when Christie’s presented Shonibare’s sculpture, with his characteristic mix of Victorian and African codes, there was manifest excitement as the bidding stepped up. In the end, the work largely doubled its high estimate, coming very close to $330,000 (Girl Balancing Knowledge, Christie’s London). The price increase of works by Henry Taylor is just as impressive with his auction record doubling in two years. It now stands at $362,000 since 26 June (C&H, Sotheby’s London) and his annual auction turnover crossed the million-dollar threshold giving him the 172nd place in our global ranking. His portraits of African-Americans also seduced the jury of the Robert De Niro Sr. Prize this year, as well as the director of the Blum & Poe gallery with whom the artist has just signed. Accessible for less than $10,000 ten years ago, his paintings have never enjoyed so much demand and his prices never been so high. In our Top 20 ranking of new world records, Hurvin ANDERSON stands out with a result of $3.4 million that added two million dollars to the work’s high estimate (Country Club: Chicken Wire at Christie’s London on 6 October 2017). That result puts him on the same auction footing as the much appreciated American revelation, Njideka Crosby. Born in 1965 in Birmingham UK to Jamaican parents, Hurvin Anderson explores themes related to the identity, community and memory of his Afro-Caribbean culture. His recent works contain explicit references to Malcolm X and Martin Luther King, as in the canvas Is it OK to be black? that was shown at London’s Tate Modern after the artist was shortlisted for the Turner Prize in 2017. Although he did not win the Turner Prize, Hurvin Anderson has benefited greatly from this spotlight, notably on the auction market. In New York, as in London, there is a clear acceleration of records for this young market focusing on Africa. Moreover, buyers are not only Westerners. The auction companies are receiving bids from the African continent, including Johannesburg, Lagos and Accra. In France, the price thresholds reached for Contemporary African and Afro-descendent artists are much lower than in the United States and the United Kingdom. Nevertheless, the inflationary trend is equally discernible. 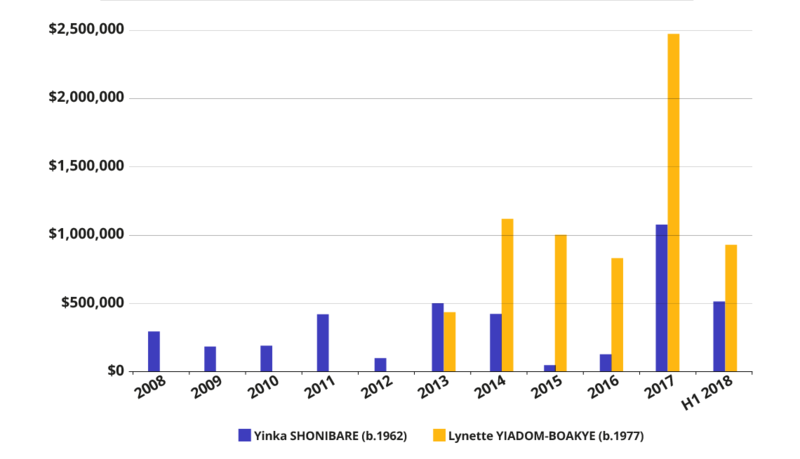 For example, the two auction records obtained for the Congolese painter MOKE during the year 2017: $51,000 for Bar nocturne and $38,000 for Classe des femmes, respectively sold at Cornette de Saint Cyr in Paris in April and December 2017. Like Chéri SAMBA and Etude de ceinture, this key painter from Kinshasa’s art school remains a long way behind the price levels reached by American or British artists from African diasporas. However there can be no doubt that their markets are growing at a fast pace. We also saw a record last year for the Senegalese photographer Omar Victor DIOP who draws his inspiration from Western art or from fashion photographers like Richard AVEDON. Revealed at the Bamako Encounters Biennial art fair in 2011, this worthy heir to the great African portraitists Seydou KEITA and Malick SIDIBÉ has had a buoyant career since the revelation of his series Diaspora (2014) in which he depicts characters from the African diaspora. The French auctioneer Artcurial hammered his best result so far for a work from this series titled Omar Ibn Said; Série Diaspora at a specialised sale in Paris (Paris # Marrakech: African Spirit) on 30 December 2017. The work fetched $25,000. The artist’s prices would acquire a very different dimension if his works started selling on Anglo-Saxon markets. For the time being, they are reserved for the Parisian market where all of Diop’s works have found buyers. Between the patient work of promoting Contemporary African art in France and the explosive enthusiasm in the United States and the United Kingdom for artists from the African diaspora, the international market is undeniably opening up to black artists. The $21.1 million bid for Kerry James MARSHALL’s Past Times – an absolute record for a living African-American artist – suggests a new and global locomotive has joined the Contemporary Art Market, one that will surely strengthen the optimism and the future commitment of the market’s vendors.